Geneva, February 27, 2001 – A full production specification, road-ready version of the Ford Focus RS, inspired by Ford’s World Rally Championship car, breaks cover at the 2001 Geneva Auto Show. Following the exterior reveal of Focus RS at last year’s British International Motor Show in Birmingham comes a production ready car with fully engineered RS chassis, 200-plus-PS engine and drive train, plus a unique interior package, with styling cues straight from the WRC contender. Conceived and produced in just 15 months, Focus RS marks an industry first for speed of development. Significantly, it is the first Ford product in five years to wear the famed RS insignia on its flank. Under the guidance of Ford of Europe Vice President of Product Development Martin Leach, the creation of the Focus RS is further proof of Ford’s product-led transformation in Europe, and Leach’s commitment to delivering a menu of performance derivatives to European customers. It is the ultimate front-wheel-drive, high-performance road-going Focus. While the Focus RS is clearly derived from the standard production model, around 70 per cent of the basic components have been changed or re-engineered. It fully meets Ford’s stringent criteria for mass production vehicles, especially with regard to safety, quality and engineering excellence. The car will enter production at the Saarlouis plant in Germany in the summer of 2001, and be introduced thereafter in selected European markets. 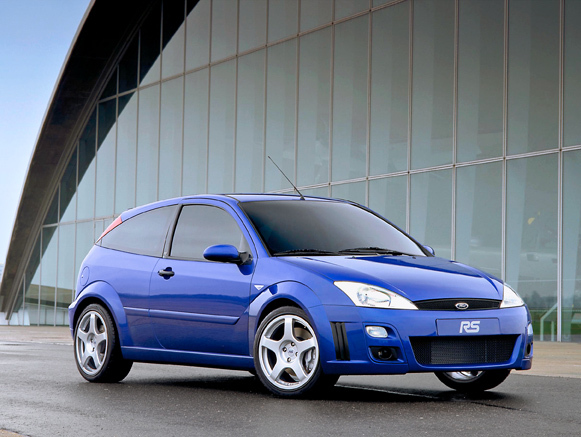 To achieve the required handling prowess in conjunction with the new 2.0 litre, turbocharged Duratec RS engine, Focus RS presented a number of design and engineering challenges in order to achieve one of its main objectives, that of transmitting more than 200 PS through the front wheels. A critical part of the Focus RS handling solution relies on the redesigned front suspension. Changes include a wider front track – increased to WRC tarmac specification to provide further benefits in handling. Sachs Racing dampers and matched springs are incorporated to handle the increase in loads and provide superior body control. Improvements in kinematics and additional rebound travel on the front suspension of the car have been tuned to ensure that during cornering, the inside front tyre remains loaded and firmly in contact with the road. Another key aspect of front wheel control is a Quaife automatic torque-biasing differential, designed for optimum traction. This sophisticated unit quickly detects a reduction in the level of drive to a front wheel and seamlessly distributes torque to prevent wheel spin. Aiding the system is revised static negative camber for the front suspension geometry. The rear engine mount and cross-member are upgraded to cope with the higher shock loads and torque and an 18mm front anti-roll bar is included to maximise traction whilst maintaining handling precision. Brembo 325mm ventilated discs and four-pot callipers provide vice-like retardation at all speeds. Standard Focus steering includes a quick rack with 2.9 turns lock-to-lock and this is retained and retuned for increased responsiveness along with a revised power steering pump. The outstanding balance of torque and race-inspired vehicle response give Focus RS unrivalled steering control, feel and agility. At the rear, the revolutionary Focus Control Blade multi-link rear suspension is retained, but increased in stiffness for greater durability. This set-up is complemented with Sachs Racing dampers, increased negative camber, higher load capacity bearings, redesigned spindles and anti-rollbar link for improved roll stiffness. The braking system comprises solid 280mm discs with conventional two-pot callipers. Completing the chassis transformation is a bespoke set of 18″ diameter OZ Racing light alloy wheels, fitted with 225/40R18 Michelin low profile tyres developed specifically for Focus RS. Considerable work has gone in to fine tuning the tyre characteristics to optimise the vehicle’s handling and performance potential. Combined, the chassis modifications provide Focus RS with outstanding body control. Front and rear roll stiffness has been optimised to provide the ultimate handling balance and yaw response. Focus RS utilises a modified version of the Duratec four cylinder, double overhead camshaft engine uprated by around 70 per cent through a host of internal changes and the addition of a turbocharger and water-air intercooler. Duratec RS specification includes the standard engine block fitted with a modified oil return system and WRC design forged pistons but with lower compression. These in turn are matched to forged connecting rods. Camshafts remain unchanged and higher-grade spark plugs are fitted to cope with the higher heat range. The front of the engine houses a new design of Garrett turbocharger with WRC, water-cooled technology to optimise performance and durability. The size of the unit is optimised for high efficiency and impressive torque delivery throughout the rev band. A new fabricated exhaust manifold is optimised for low down torque, and the 65mm high-flow large bore stainless steel exhaust system features a revised three-way catalytic converter to comply with Euro Stage III emission regulations. The exhaust system is optimised for minimal back pressure. Further under bonnet packaging includes a brand new air intake system matched to the increased flow demands of the turbocharger. The temperature of the charge air entering the new throttle body is controlled by a unique water-air intercooler. A separate radiator utilises its own dedicated water cooling supply and is significantly more efficient than the conventional air to air intercooler. The spent charge leaving the turbocharger enters the intercooler at a typical 150° C and exits it below 45° C. While this type of intercooler requires a more complex installation with its separate water pump and radiator, the no-compromise design philosophy dictated this as the optimum system for Focus RS. Engine longevity is safeguarded by the employment of a water pump with 50 per cent more flow, and a high efficiency oil cooler. Additional ‘run on’ cooling fans are fitted and the engine bay is treated to generous heat shielding with higher grade materials used to counter the increased under bonnet temperatures. Further, the whole engine and drivetrain has been extensively tested to ensure it meets all the usual criteria for mass production. A remapped version of the Ford EEC V engine management system controls fuel delivery through higher flow rate injectors. Additionally, the fuel system is completely new with a high-flow pump and pressure regulator valve. Power to the front wheels is through a heavy duty AP Racing clutch coupled to a revised and uprated version of the 5-speed MTX75 transmission. Unique to Focus RS gear ratios coupled with the sports short-throw shifter mechanism provide an enthusiastic punch when driving, with the gears chosen to extract optimum performance if worked enthusiastically. However, the impressively high engine torque levels provide more than adequate performance in more leisurely, low rpm driving so that the gearbox doesn’t need to be stirred excessively to release a heady surge of power. The performance potential has been optimised to the chassis for a “rally car for the road” driving experience. While the bonnet, doors roof panel and tail/headlamps remain standard, every other exterior element has been painstakingly developed and honed to help create a car worthy of the RS name. Rather than overcomplicate the styling, Hilton has chosen to detail forms with crisp accentuating lines, combining sophistication with racy elements. It was important that Focus RS reflect styling cues from the WRC project, but with added modernity and production feasible materials. To this end, the car utilises brand new sheet metal for the front and rear wings with wide wheel arch extensions to complement the wider track. These components are matched to durable reinforced polypropylene moulded front and rear bumpers, side sills and a rear spoiler mounted on the tailgate. While the same basic theme of the rally car is retained, more aggressive front and rear bumpers have been developed for Focus RS. The rally version is designed primarily to produce lots of downforce at speeds not much more than 100 mph. More downforce provides lots of grip but a loss of top end speed. In Focus RS, the emphasis is much more on higher speed stability. As a result, the car has been extensively wind-tunnel tested using data gathered from the WRC programme. Viewed head on, Focus RS incorporates similar grille apertures to the WRC, but with added Hella fog lamps. Air flowing through the deep front grille is directed through outlets positioned as twin slots in front of each wheel. The radiator for the highly effective water-to-air intercooler system is positioned directly in this airflow for maximum cooling effect, thus optimising engine inlet charge air temperatures. The result of the revised styling and wider footprint tyres is a drag co-efficient of 0.365, which is highly efficient considering the increased frontal area. This year’s WRC Focus now sports a less aggressive rear spoiler design similar to that of Focus RS. Inside, Focus RS has been developed to reflect the racing theme but with simplicity, style, quality and durability very much in mind. Just three surface colours are utilised throughout – black, blue and silver. The most striking of all the interior appointments are the race-inspired seats. Developed in conjunction with Sparco, these high quality items are stitched in black hide with contrasting blue leather cushion and backrest inserts. Bold Sparco branding on the backrests and discreet RS logos embossed on the seat cushions complete the heritage link. They offer impressive lateral support and, just like the full racing version, have integrated harness slots within the headrests. Significantly, the RS Sparco seats have been developed with durability and ease of use for everyday driving. The silver interior elements comprise an aluminium handbrake lever; short throw shifter knob, headrest slots, Sparco aluminium pedals with rubber inserts, and electro-plated door handles. The steering wheel is trimmed in blue and black leather to reflect the seats and incorporates an oversteer indicator. Further rally car cues include a functional start button sited on a real carbon fibre centre console, which can also accommodate a pair of sunglasses. The instrumentation for Focus RS is unique. The frame bezel is revised, with bold and more precise graphics. Backlit blue bands on a black field encircle the speed and rev gauges. A turbo boost gauge is added and a change-up light lends a further competition element. In spite of its sporting image and exhaust note, Focus RS is more than a unique new driving experience. Creature comforts and general convenience levels have not been overlooked and the car retains its highly practical interior layout with seating for five, power-assisted windows, steering, air conditioning, and Ford’s novel new in-dash mounted six-CD player accessed through a single slot. For the safety minded, both driver’s and passenger’s airbags and side impact protection beams are included as standard equipment. Engine: Ford 2.0-litre Zetec engine 4-cylinder, 16 valve. Electronic Ford Engine Management Syetem. Garrett turbocharger. Catalytic converter. Drive system: Front wheel drive with Quaife Automatic Torque Biasing Differential. Transmission: Uprated MTX-75 5-speed, unique gear ratios, AP racing clutch. Suspension: Front Macpherson struts, Sachs dampers Rear Control Blade multi-link, Sachs dampers .